In his post: Use your day recognized as Thanksgiving to teach our kids how to be generous and thankful all year long – but don’t whitewash the violent history of colonization. The Thanksgiving myth is based in theft and greed. We want Thanksgiving to be a celebration of gratitude and generosity. Can we honestly do that if the entire history of thanksgiving that we teach our kids is a lie? We have no right to stay on this land without taking responsibility for what we’ve broken, and taking action to repair it. My family still reaps the benefits of showing up on these shores with light skin and settler expectations, as European and Asian immigrants. Even if my ancestors aren’t the Puritans who stole Wampanoag food stores and ravaged the graves of their children, my family is still complicit in the oppression of Indigenous Americans. We wrestle with teaching my kids about the messy network of past and present injustice. We try to fit that into a vision of what we want for the future – a country that obliterates nationalism, racism, closed borders. We teach our kids about the victimization of both the people who were here before us, and those who have still yet to arrive. It’s a lot to ask of parents – doing the daily work it takes to get dinner on the table, trying to grow into the people we want to be, and setting a better example for our kids. I still don’t know what this day should look like. I want to come together as a family. I want to reinforce the value of generosity, appreciation, and connection to the land. But I don’t want to erase our history or pretend this violence is over. It’s not. Is it possible to decolonize the holiday we settlers call Thanksgiving? Not really. We can’t celebrate the myth of a ‘first’ thanksgiving as if white colonists invented it. It’s not just ignorant – it’s violent. The Wampanoag people have been celebrating thanks giving every day for thousands of years. The one our kids are learning about in school was most certainly not the first. We need to retire the white-centered holiday of Thanksgiving. This holiday erases and condones the damage we’ve done by coming to this land and continuing to occupy it. We need to start something new in it’s place. Something that doesn’t whitewash our shared history. Something that acknowledges our part in colonization, and forces us to take responsibility for how we move forward. Understanding our history acknowledges the agony and shame of our present – a vital step in fixing what’s broken. Can we (and should we), as the descendants of settler immigrants, maintain a sense of safety and belonging while acknowledging the harm we’re doing by living here? I want a sense of home for my children. I want them to feel like they belong to a community who accepts them. I don’t want my children to grow up feeling the way I did – like aliens in their birth land with no where else to go, unwelcome and resented on every single square inch of this planet. For many reasons, packing up and leaving the country isn’t an option for us. We can’t give back this land without forfeiting our lives. Decolonizing our presence – without leaving – I’m still not sure how to do that. So for now, we read books. We read books about our history that break our hearts. We focus on gratitude for what we’ve inherited. And responsibility for what we need to pay back. All of these, together, show us ways to heal the future. This is way outside my lane. But – it also gives me access to an audience that wouldn’t ordinarily pay attention to this stuff. I could stay safe and silent, while less cautious parents blunder forth, spewing cheery Thanksgiving myths and Indigenous stereotypes that directly harm modern Indigenous people. That seems like a bad choice. I chose the books below because they create an accessible bridge for my kids to start learning about the history of history and contemporary life for people whose heritage spans far beyond our arrival. These books span cultures beyond US borders, since those same borders are byproduct of colonization. While I found, researched, and screened these books with my kids and processed them through our settler’s gaze, I tried to verify that my choices are respectful, accurate, and don’t cause more harm than good. One of the ways I verified my choices was to check Deb Reese’s American Indians In Children’s Literature (with her permission) and invested in a copy of A Broken Flute by Doris Seale & Beverly Slapin. Check these resources out, as they go into great depth on problematic and recommended books that I don’t want to parrot here. I’m trying to boost the best books, but not appropriate Indigenous research and voices. If I stray too far out of my lane, leave a comment with notes or corrections. Books For Littles(BFL) is free and accessible for readers who can’t afford a paywall. Posts may contain affiliate links, which allow me to earn a commission at no extra cost to you. Check out the full affiliate disclosure along with the BFL statement of accountability. You can also support BFL on Patreon. Crazy Horse’s Vision – The moderately violent massacre scene in this story gave our family lots to unpack and discuss. The story is also fantastic for setting positive expectations for leadership. Shi-Shi-Etko – One girl’s experience being forced to attend a residential school. The sequel, Shin-Chi’s Canoe, is equally as good. Buffalo Bird Girl – A rare women’s history biography beyond Pocahontas & Sacagawea. Includes real photos and blends cultural details of life in for a Hidasta woman with the story of a real woman. The Gender Wheel – How discrimination and violence against intersex, two-spirit, nonbinary, and trans people is a byproduct of colonization. Not My Girl – The impact of residential schools on Indigenous children who have lost their language, culture, and family connections. What’s My Superpower? – Normalizing modern Indigenous kids in a cute story that takes place against in Nunavut. My Heart Fills With Happiness – Celebrating modern connected with tradition. Wild Berries – Gathering, connecting with the land, elders, on an ordinary blueberry picking day. My Wounded Island – The impact of climate change and environmental racism on a young girl’s community – and the fear of cultural erasure that comes with it. We Are Grateful: Otsaliheliga – Life through the seasons celebrating modern Cherokee traditions. We Sang You Home / Ka Kîweh Nikamôstamâtinân – In the style of of a lullaby for babies, celebrating the next generation in poetry that flew right over the heads of my (non-Indigenous) kids, but then again, we’re a very literal family and poetry is our kryptonite. When We Were Alone – In oral tradition, a grandmother passes on the story of how she and her brother persevered and continue to resist the miseducation and abuse she faced in residential schools as a child. The People Shall Continue – A brief, powerful statement of history and endurance through colonization & continued attacks. Beaver Steals Fire – I love this mainly for the foreword, which pulls back the Indigenous curtain a bit (rules set in place to keep stories safe from white distortion and appropriation) to help settlers understand the seasonality of stories and the byproduct of colonial arrogance and ignorance on our environment. A Coyote Solstice Tale – A cheeky trickster story poking fun at materialistic consumerism over the holidays. More of a post-thanksgiving story, but it fits. Her Right Foot – A little lofty, but beautiful reminder that our modern nation has been built stronger for diversity, and we must fight to keep striving for equity and inclusion. Blue Sky White Stars – Gorgeous paintings depicting the diversity of American citizens. We Came To America – A simple book on the fabric of modern America, as it was built by people from around the world. Including Indigenous people who were here first, those who immigrated here by choice, those who fled here as refugees, while also acknowledging how slavery forced many to come here without choice. Ladder To The Moon – A dreamlike story fostering inclusion for immigrants. Dumpling Dreams – An immigrant story of integrating Northern Chinese cuisine into the American menu. Brick By Brick – Caveat: this might not be for you. In the wrong hands, this can be alienating and reductive. A poem showing how the US government was literally built on the labor of enslaved Americans. The device starts with focusing on Black bodies (hands, etc.) before personalizing the people with names. If your family isn’t already educated on the exploitation of Black labor, try reading Heart And Soul first. 3 Balls Of Wood – This one isn’t US-based, but it’s still awesome and illustrates how unique perspectives make the world better. The Sandwich Swap – How different cultures (in this case food) can seem foreign and strange, but actually enhance our relationships and give us new perspectives. Peaceful Fights For Equal Rights – A rallying cry showing many ways we can all fight for justice, putting our own small efforts to create a bigger, collective change. The Wampanoag tribe were the first to encounter the Puritan colonists who settled on on what’s now Massachusetts. Pretty much everything you’ve heard about ‘pilgrims’ is a spun truth or outright lie. The education I received as a child in the MA public school system, and the stories my own son is being taught today in that same system make no damn sense at all. The picture books we read feature holes you could sail the Mayflower through. Painting the violent, greedy behavior of the Puritans as friendship created a deep dissonance any reasonably attentive 5-year-old has noticed. Understanding this betrayal is the foundation for our hometowns created a rancid, unspeakable shame. I could find only two books for the under-7 crowd on our local Wampanoag tribe – ones that aren’t viewed through the white gaze. Both are approved in A Broken Flute: The Native Experience in Books for Children. I’ll admit they are both didactic (best suited for a class discussion than story time) and weren’t engaging for my kids. But they will have to do until I find something enrapturing. Hey while I have you – this same tribe – the Mashpee Wampanoag are under attack from the US government right now. Please call your senators and support S.2628 the Tribe Reservation Reaffirmation Act, which affects not just our tribe, but tribes across the US who are at risk of having even more land and rights stripped. IT IS 2018 – colonization is still in progress, and it’s your job to stop it. Clambake – A modern Wampanoag tradition, showing kids that the Wampanoag are not just mythical beings from history, but actual neighbors and contemporaries. 1621: A New Look At Thanksgiving – A didactic book on the Thanksgiving story, from the perspective of the Wampanoag tribe. Teach your kids what their ancestors went through to make a home here, and why it’s so important not to shut the borders down behind them. Dreamers – A poetic retelling of the author’s experience navigating the US, tangentially addressing the poor immigration policies that break healthy circular migration. Heart And Soul – Understand that some American ancestors came here on slave ships – not by choice, and the luxuries and freedoms we enjoy were built on their backs. A Different Pond – An early morning in the life of Vientamese refugees, keeping their heads down, trying to survive in the US. Small Beauties – A reminder for my Irish family who seem so keep on shutting US borders to refugees – how hypocritical it would be to shut the door and lock it behind us. The Journey – A heart-wrenching story of a mother and her children while they flee from violence across a terrifying and hostile journey. My Name Is Not Refugee – A gentle walk-through for very young kids to help them empathize with kids just like them who must flee conflict. Be The Change – Take responsibility for your actions. A reminder that every single choice we make impacts those who have less than we do. Shelter – Take responsibility for sheltering those in need, breaking past a scarcity mindset and a reminder that every one of us is vulnerable and will one day be in need of help. Take The Time – Take responsibility for how we treat each other. Small social actions to remind kids to slow down, connect with others, and acknowledge our mistakes. Super Manny Cleans Up – Take responsibility for being a leader and healing harm you didn’t cause. On deciding to clean up and heal our local communities, particularly when no one else seems to notice, even if it’s not our fault. If You Plant A Seed – Take responsibility for those with less. On sharing the fruits of our labor, even with those who don’t seem to deserve it. Sharing The Bread – Take responsibility for our family responsibilities. This is the most US-centric of the stories in this collection, featuring a white family in a settler homestead. 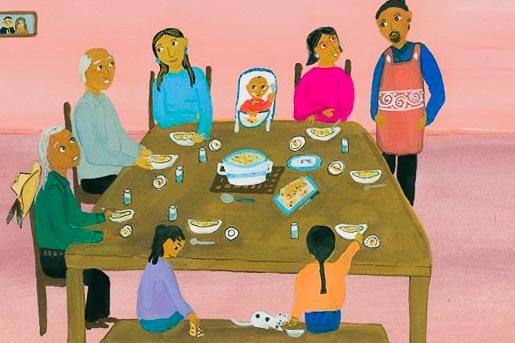 The trouble with many books featuring white families on Thanksgiving is the addition of half-dressed, token Indians complete with feathers and face-paint. Or the complete erasure of colonial impact, suggesting that everyone is happy now that white folks are here. This book exists within a bubble, not out of oblivion, but as a mindful choice. Zietlow Miller wisely stayed within her lane, choosing to focus on the smaller family dynamic, without painting settlers as saviors. There’s one page featuring kids constructing European Puritan hats, which obviously is problematic – we’ve got enough glorification of invaders. However, it’s also an opportunity with the right knowledge – ask your kids what settlers are taught from the dominant narrative, and why the US chooses to celebrate European immigrants, but not immigrants from anywhere else. If you’re willing to use page this as a learning discussion – I love this book. Each member of the family (regardless of age or gender) contributes and works together to build the meal. Before we can learn to create a culture of true equity, we’ve got to appreciate the privileges and opportunities we’ve inherited. Teaching kids like mine (who have been given everything I’ve ever wanted for them) to understand what it’s like to have less is a work-in-progress. This should be a 365 days a year thing, obviously. At this age (4 & 6), we’re teaching them to be mindful of what’s going on around us, to understand the obstacles we don’t have to navigate, and to try not to take their luck for granted. It’s worth noting, as our supporter Monica R. points out – this might be the one day when we should dial back the gratitude. Being thankful for what we have on this particular day is a celebration of all the things we’ve inherited at the cost of someone else. Awesome Book Of Thanks – This one is just fun, and shows there’s more to gratitude than saying ‘thanks’ when someone hands you a gift. It’s a little weird, which works well for our family, but might be too much for others. Circle of Thanks – Connecting in mutual help through a chain of kind actions, featuring arctic animals. Written by an Alaskan author (who claims not affiliation on her biography), but I wasn’t able to verify accuracy in the illustrations and tone of this story, which portrays an Iñpiat-presenting mother and child. The Table Where Rich People Sit – Demonstrating how wealth isn’t a bank account, it’s access to choice. How choosing our possessions and lifestyle with intent (when possible) gives us more to be grateful for than stuff. Giving Thanks: A Native American Good Morning Message – My kids will. not. sit. still. for this one, but it’s widely recommended by Indigenous authors and critics. Most notably – how for many Indigenous tribes, thanksgiving is a daily act, which they have been practicing every single day for several thousand years, not something that should be reserved for once a year before a big shopping trip. Greet The Dawn – Not a story so much as daily morning prayer of gratitude, you’ll have to prep kids with the understanding that this doesn’t have a beginning-middle-end, but is more of a song, of sorts. It’s gorgeous. Give generously – even if when you don’t expect anything in return. Especially to those who have nothing to give in return. Say thanks – support BFL and help us ignite the next generation of kind & brilliant luminaries. Bonus: you’ll get access to exclusive Books For Littles articles I don’t share anywhere else. Thank you for this list! I just wrote a blog post about holiday picture books, and I’ve added a link back to this post because these are invaluable suggestions. I find Thanksgiving so thorny that for my post, I chose books that focused on the Macy’s Parade (I’m a New Yorker) and the immigrants who made it possible and on two books about harvest and apple pies (my husband’s Thanksgiving specialty). I’m looking forward to incorporating some of these titles into my rotation. Thanks for this – I’m trying to sort through our enormous collection on holiday books and I’m so glad your post tells us about Dia de Los Reyes, which I didn’t know about! Thank you! Thank you for this list! Trying to navigate how to introduce the topic to my young kids. Thank you SO much for this booklist!! We loved it.